Hang a banner for that one Smashville. Hockey is a stupid sport and I don't much care for it anyway. The Rockies don't need a full rebrand. Their alternates and road grays are completely fine. I would just try to improve upon their primary & cap logos and add some more purple to the home whites. Keep the pinstripes, but a new font for the wordmark would be fine too. I just can't imagine a green/purple combo working for them. I admire the Rockies for sustaining the same general aesthetic since their inaugural season. Is it the best in MLB? 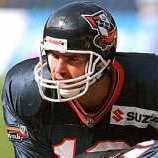 Of course not, but it's much better than what the other three 90s expansion teams are wearing at the moment. And those three have all undergone several major rebrands in the interim. The Rockies have sustained a classic look and beat them all. Bottom right...and I've changed my mind on the name. My choice would be Atlanta Aviators now. That double red looks great! Experimenting with different color schemes: C&C Welcome. And would the Firebirds name be preferable too? Given some of the challenges with Utah fans, I don't think dressing the crowd like a Klan rally was the best idea. I thought the whole time Chicago was black and white, with silver accents. Still, doing something like that could work for the Rockies, even if the silver is barely noticeable. Atlanta's new logo, leaked by the Atlanta Journal... The name will either be Aviators, Pilots or Fighters. C&C Welcome.